We're delighted to announce that Waitrose & Partners has retained it's tier one ranking in 2019's Business Benchmark on Farm Animal Welfare. We have moved up three rankings in the report since 2012. At Waitrose & Partners, we believe that animal welfare and good business go hand in hand; this is not just because our customers expect and rely on us to be doing the right thing. Rearing livestock well and ensuring that high welfare standards apply throughout the animal’s life are vital to ensuring the quality of the meat we sell. So, we work closely with our UK farmers to ensure that all the livestock that provide the meat, poultry, eggs, milk and fish products we sell are reared to the very highest welfare standards. Freedom from Fear and Distress – by ensuring conditions and treatment, which avoid mental suffering. However, we believe we need to go beyond the universal five freedom measures of animal welfare. We recognise that as sentient beings animals have the ability to both feel pain and experience positive emotions such as joy and pleasure. As such, whilst we currently capture a breadth of welfare outcome measures we feel it is the right time to explore further measures such as those underpinning the freedom to express positive emotions. We have been actively working with independent industry experts including academics, NGOs and animal welfare specialists to develop the extended list of outcome measures for each supply chain. In 2018, the expert panel, suppliers and ourselves formed the Waitrose Animal Welfare Development Group and we aim to share the findings by 2020. In our UK supply chains, Waitrose welfare requirements extend beyond basic Red Tractor Assurance with bespoke standards that farmers must adhere to and that are independently verified. Close confinement systems, including farrowing crates and caged hens, are not used and stocking densities are lower than average across the supply chain. Journey times are much shorter than the legal maximum, with Waitrose implementing our own maximum travel time requirements for some supply chains. We conduct our own assessments of farm management practices, and farms are independently audited by the relevant assurance schemes, supplemented by our own bespoke standards (detailed below). Our hauliers undergo livestock handling and welfare training and our slaughter sites are reviewed by the Humane Slaughter Association. All supply chains are committed to eradicating on-farm mutilation with procedures such as fish fin clipping forbidden and pig tail docking only permitted with veterinary recommendation. We are committed to finding alternatives to all forms of livestock mutilation. Production is kept as natural as possible by providing environmental and social enrichment, utilising a high forage diet for ruminant species and ensuring that dairy cows graze for at least 120 days out of the year. In fact, during 2017 our conventional (non-organic) dairy farmers managed to graze their herds for an average of 181 days, with our Organic dairy farmers averaging 205 days. You can see examples of our key animal welfare policies – general as well as by species – and measures below, along with key performance indicator graphs showing historical welfare outcomes across supply chains that are monitored by our farmers and processors. All of this is particularly important to Waitrose, as we never buy livestock or meat on the open market. Instead we only work with farmers we know and trust and who share our values. Our Agriculture Manager, in conjunction with the Waitrose Farming Partnership Livestock Steering Group (WFP LSG), is charged with the overall responsibility for animal welfare in the Waitrose Supply Chain. Members of the LSG are all livestock experts from Waitrose and its dedicated suppliers. Key members of our technical teams undergo animal welfare training, for example Bristol University’s Poultry Welfare Officer training and the University of the Highlands Islands’ course on Fish Welfare. The Waitrose Corporate Social Responsibility Committees (comprising members of the Waitrose Management Board and external representatives) have oversight of the Waitrose CSR strategy and priority issues, including animal welfare. We have achieved significant recognition for our commitment, over the years, to higher animal welfare systems. In 2017, we won the Compassion in World Farming Best Retailer Award, facing competition from 4 other UK retailers and 9 European retailers. This was the 4th consecutive time we have achieved this accolade. Since 2015 we have been one of a small number of businesses that have achieved Tier 1 status for the Business Benchmark on Farm Animal Welfare (BBFAW) an annual survey undertaken based on a businesses commitment to animal welfare. Waitrose and its suppliers have won the Compassion in World Farming Good Chicken Award, Good Egg Award, Good Pig Award, Good Dairy Award have also been awarded the CiWF Best Marketing Award for our Dairy Grazing Campaign in 2016. In 2017 we were proud to receive an inaugural CiWF Cage Free Award. This is an industry-leading award made possible by our partnership with Winterbotham Darby, who supply our authentic continental pig meat. All our policy commitments, unless explicitly stated otherwise, apply to all of our own-brand supply chains, including our UK supply, our New Zealand lamb and venison and our authentic continental pig meat sourced from Europe via our partner Winterbotham Darby. We work very closely with our own-brand supply chains to ensure our high standards are upheld. In addition to our own-brand ‘Waitrose’ products, we also sell branded products in our stores, which are produced by a range of companies from household names to small local suppliers. Branded goods represent approximately 47% of Waitrose sales. Our influence over the policies and performance of branded goods is, of course, much more limited. We are however actively exploring how best to work with branded suppliers to influence positive change for animal welfare in the wider industry. We have already taken concrete steps to apply key sustainability policies to high impact areas for branded goods. For example, we work with our suppliers of branded tuna to improve their sustainability credentials, and are committed to ensuring that all of our branded canned tuna is either Marine Stewardship Council (MSC) certified or pole and line caught. This builds on Waitrose’s own responsible fish sourcing programme which has been running for nearly 20 years; all of our own-brand canned tuna has been pole and line caught since 2009 and MSC certified since 2013. Waitrose recognises the potential risks to human healthcare of the overuse of antibiotics in livestock supply chains. This is why, within the Waitrose supply chain, all antibiotics are used carefully, under strict protocols and only in controlled circumstances; entirely healthy animals are not routinely given antibiotics, they are only used for treating ill animals or for those with pre-existing conditions. We maintain that some antibiotics are important medicines to hold in the animal health armoury but they must be used sparingly, under the close supervision of a veterinary surgeon and only as a last resort when other courses of action have proved ineffective and when welfare would be seriously compromised if they weren’t prescribed. This protocol applies to all our supply chains, including aquaculture. Across the Waitrose Supply chain, we have formed a cross species Responsible Animal Health Group to share best practice in this area. One specific area of concern is the use of critically important antibiotics (CIAs), which we define in line with the World Health Organisation (WHO)/European Medicines Agency (EMA) recommendations with the addition of Colistin. CIAs are rarely prescribed and none of our supply chains ever use Colistin to treat livestock. All our own label supply chains are working with urgency towards continuous and significant year on year reductions in usage of all antibiotics and have pledged to end the use of all CIAs as soon as possible. Our supply chains are focusing on the collation of antibiotic usage data for all livestock and aquaculture and are prioritising a greater emphasis on preventative screening for disease and the use of vaccination to prevent disease occurring. The Veterinary Antibiotic Resistance and Sales Surveillance (VARSS) Report 2016 highlights how the UK Agriculture Industry needs to work to reduce its antibiotic usage, to aid the overall Global initiative to decrease the use of antibiotics in an effort to effect an improvement in antimicrobial resistance. The average UK levels recorded in livestock at 45 mg/kg PCU (population control unit) in 2016 (see below), compares with 62 mg/kg PCU in 2014 and 57 mg/kg PCU in 2015. The 2016 VARSS report outlined the Government’s commitment to reduce antibiotics used in livestock and fish farmed for food to a multi-species average of 50mg/kg by 2018. This target was set out in the O’Neill report published in summer 2015. 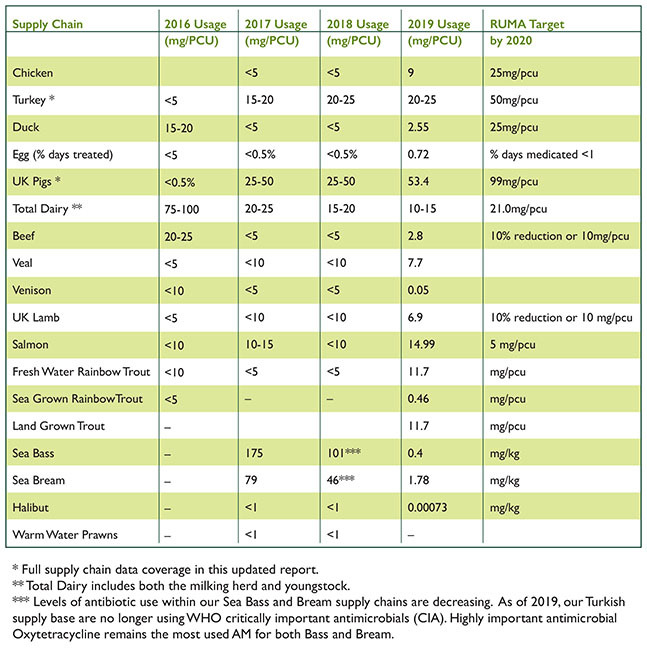 Since 2014, Waitrose, in conjunction with its suppliers have developed strategies and policies to reduce the total use of antibiotics across its supply chains, whilst keeping animal welfare at the forefront of any decisions. In addition, an escalation process has been put in place to only use Critically Important Antibiotics (CIA’s) as a last resort and used only where animal welfare may be compromised. A proactive approach to Responsible Animal Health has been developed for all livestock supply chains in conjunction with veterinary advisors. Industry sector targets were developed by Responsible Use of Medicines in Agriculture Alliance (RUMA) and industry for each livestock sector with the aim to reduce antibiotic usage by 2020. These are set out in the table below. The Waitrose 2016 sector data, presented below, is broadly under the 2020 target already. All supply chains have committed to minimise the use of antibiotics, including CIA’s, where appropriate. Our 2017 data will be published later in 2018. We were pleased to have our leading work in this area recognised as a finalist in the Antibiotic Guardian Awards 2018. All our supply chains are independently audited and we take any non-compliance of our animal welfare requirements very seriously indeed. We conduct our own responsible sourcing assessments, and farms are independently audited by the relevant assurance schemes (detailed below). Our hauliers undergo livestock handling and welfare training and our slaughter sites are inspected by the Humane Slaughter Association. Anyone found in serious breach of our standards can expect to be removed from our supply chain. The birds that provide our chicken are not beak trimmed and we have been working with breeders of our laying hens to reduce the need for trimming in those flocks; 76% of our laying hens were free from beak trimming in 2017. Trimming is carried out on a flock by flock basis should a specific welfare need arise. In 2018, we achieved our goal of 100% of our British Blacktail laying flocks being non trimmed. We are the only retailer in the UK who has achieved this. In practical terms this means that 100% of the British Blacktail Hens laying our eggs are free of beak trimming. We are committed to finding alternatives to all forms of livestock mutilation. Our policy states that meat, milk, poultry, fish or egg derived from a cloned animal including subsequent generations MUST NOT be used in Waitrose own-brand products. Waitrose was a pioneer of and is committed to the removal of close confinement systems from farm production. None of our own-brand British meat or ingredient meat or eggs are sourced from close confinement systems. Today we pride ourselves on only selling free-range eggs (both whole eggs and for all our ingredients) and by having lower stocking densities than average throughout our supply chains. Furthermore, all our UK breeding sows are free range. We are working with our Continental suppliers to improve their systems where needed and to ensure all the animals we source are from farms where the five freedoms play a key role; further detail is provided in the ‘Continental Meats section below’. In recognition of this we were a recipient of Compassion in World Farming’s inaugural Cage Free Award in 2017. All our abattoirs are equipped with CCTV since 2012 to ensure welfare standards are maintained. Footage is independently reviewed on a regular basis. The use of authentic ingredients is very important to our customers and this is especially true with our authentic continental meats such as Spanish chorizo, German salami, Italian Parma ham and prosciutto, and paté. Our continental pig meat supplier Winterbotham Darby is a leader in its field. Their supply chain-wide pig scheme already significantly exceeds European legislation animal welfare standards. To drive even further progress, Winterbotham Darby has also developed the first pan-European welfare standard, the European Farm Partnership (EFP) pig module, which is accredited by UKAS (United Kingdom Accreditation Service). The EFP pig module is the only accredited standard of its kind for Europe and covers the entire supply chain: breeding, rearing, finishing, transport and slaughter. Winterbotham Darby’s work to develop this standard – as well as its achievements in supply chain traceability and consumer education – was honoured in 2018 with a Special Recognition Award from Compassion in World Farming. The standard is for higher welfare systems and takes into account health and welfare factors such as free farrowing, increased space and a stimulating environment. The standard also covers antibiotic usage and medicine, feed, veterinary procedures, biosecurity and pest control. The Pig module (UKAS ISO/IEC 17065:2012), will be audited by certification body KIWA Agri Food, on behalf of Winterbotham Darby. The EFP is a tiered system (bronze, silver and gold) which Winterbotham Darby are using to encourage farmers to continually improve their standards. All their producer farms across Italy, Spain, France, Germany and Holland will be certified to at least bronze by 2020, and to silver or gold by 2025. Great progress has been made already, with Italian producer Fumagalli having received a Good Pig Award, and Spanish producer Marcos a Good Sow Commendation, from Compassion in World Farming. We pledge that all cows producing milk for Waitrose will spend a minimum of 120 days each year grazing on pasture. In practice, our dairy cows will graze for far longer than 120 days/year but this new pledge sets in stone a minimum standard, strengthening our commitment to animal welfare and ensuring a level of consistency across our dairy farms. We are the only supermarket to make this pledge. During 2017, our conventional dairy herds were grazed for an average of 181 days; our organic dairy farmers averaged 205 days. The use of growth promoters is strictly prohibited across all our livestock supply chains. We’re proud of our animal welfare work and the accolades we’ve won and that’s why we put them at the heart of our recent marketing campaigns. We have recently refreshed our in-store messaging on farm animal welfare. We know how important this is to our customers and therefore highlight our higher welfare product standards, including specific commitments such as our dairy grazing pledge. We also use shelf barkers and point of sale information to call out our relevant awards from Compassion in World Farming. We run numerous stories in our weekly newspaper Waitrose Weekend (circulation approx. 500,000) on animal welfare and also in our monthly magazine Waitrose Food. Ablation in farmed warm water prawn broodstock: Waitrose does not support the practice of eyestalk ablation in shrimp (prawn) broodstock reproduction and expects hatcheries supplying Waitrose farmed prawns to ensure this practice is phased out by 2020. Laying hens – 76% free from beak trimming (hot blade method is prohibited). This relates to 2017 data, since reporting, we have achieved our goal of 100% of our British Blacktail laying flocks being non trimmed. We are the only retailer in the UK who has achieved this. Continental Pigs – 23% free from castration. Our supplier is researching Improvac in Italy and Spain but using pain relief for this procedure (Tri Solfren pain relief research also continues). In Spain, white pig boars are not castrated. Iberico pigs (black pigs) are currently castrated but improvac trials are underway. Continental Pigs - 41% free from tail docking. Continental Pigs - 60% free from teeth clipping. Conventional Turkeys – 0% free from beak trimming (hot knife method is prohibited). Organic Turkeys - 100% free from beak trimming. UK Dairy calves – 5% of retained stock are free from disbudding. UK Dairy calves – 95% polled. UK Dairy cows – 100% free from tethering and tail docking. Higher Welfare veal calves - 100% free from disbudding. Beef Cattle – 71% free from dehorning. Beef Cattle – 100% free from hot iron branding. Beef Cattle (males) – 0% free from castration. We are working closely with NGOs such as Compassion in World Farming (ciwf.org.uk), Responsible Use of Medicines in Agriculture Alliance (ruma.org.uk), World Wide Fund for Nature (wwf.org.uk), Marine Stewardship Council (MSC.org), Marine Conservation Society (MSCUK.org), The Soil Association (soilassociation.org), Clientearth (clientearth.org) to address key welfare and sustainability issues in our livestock and fish supply chains. Projects include ways to raise heavy weight pigs without castration and the certification of all our fish species by 2020. Our original target date for fish certification was 2017, against which we reported progress of 89.6%. Some species are particularly challenging and as such we are currently investing in MSC projects to support UK fisheries for scallops and nephrops to become certified. We have also engaged with a wide range of stakeholders on the use of antibiotics in the livestock supply chain including the World Health Organisation, the National Farmers Union and the Veterinary Medicines Directorate. All the livestock that provide meat for Waitrose are pre-stunned before slaughter to ensure they are insensitive to pain before being killed. All our farmed salmon, sea farmed rainbow trout, rainbow trout, brown trout and halibut are pre-stunned prior to slaughter. Salmon health in our aquaculture systems. Non-lethal predator deterrents on fish farms. Dairy herd health and welfare production benchmarking. Proactive dairy herd health management – e.g. Bovine Viral Diarrhoea eradication plans and Johne’s disease eradication. Eliminate tail biting in pigs. Reduce Kyphosis (humpback) in piglets. Transport / lairage and slaughter welfare of pigs. Relationships between farmers and vets on AMR usage. Stress levels in cattle – including when in the lairage. Pelvic floor measurement in heifers. Pain minimisation / reduction during disbudding of cattle. Liver fluke monitoring in cattle. Slaughter welfare of cattle, continuously improving accuracy and effectiveness. Measuring temperament in the lairage and handling facilities of deer. Air and feed quality for young ducklings. Natural daylight in duck houses. Perch design for commercial broiler chickens. Enhanced farm biosecurity in turkeys. Increasing the supply of sustainable forage sources via different protein crops. Feather cover, reductions to beak trimming and keel bone damage in laying hens. Pasture vegetation for seasonal goose production. The implementation of farm welfare outcomes. Biological control of sea lice in salmon farms. Investigation of responsible vaccine use. We do not accept TB reactor cattle into the Waitrose supply chain. Waitrose does not permit the long-distance live transport or live exports of animals in its supply chain. We have transport policies for each of our species (see below) and report on actual journey times also. All of our transport times are below the maximum allowed under UK legislation. All our beef cattle are British and our farmers work to strict animal welfare protocols ensuring the highest standards of husbandry and welfare to ensure stress free, naturally produced, healthy cattle. During spring and summer, our cattle are reared on open pasture in social groups and during winter protective shelter is made available in bedded barns. Cattle are finished on a natural forage-based diet. If grass is in short supply, cattle are fed other natural options such as silage. Stocking densities are carefully controlled and lower than average. Over the last 10 years we have developed our Cattle Connect scheme to ensure all bull calves born into our dairy herds move into our beef supply chain. Calves provide either higher welfare veal or beef for Waitrose. This ensures that the dairy bull calves have a productive life which is a key criteria of the Compassion in World Farming Good Dairy Award which we hold. This also ensures none of these calves are exported abroad and that they are all retained within the UK. Welfare of cattle going to slaughter and when at the abattoir is of the utmost importance to us. All cattle are transported directly to the abattoir by Red Tractor approved hauliers. This ensures all vehicles and drivers meet required standards to ensure our welfare standards are met. All our farmers must be located within a six-hour drive of the abattoir; most are within a four-hour drive. The legal time limit for a cattle journey in the UK is eight hours. Our abattoir is approved by Red Tractor, RSPCA Assured and the Soil Association and is regularly inspected. Our slaughter facilities were designed incorporating the ideas of leading animal behaviourist Temple Grandin and purpose built to ensure a quiet and stress free environment for the cattle. All staff members involved in the handling of cattle at the abattoir must be trained in welfare friendly animal handling methods and demonstrate a sufficient level of competence before being allowed to handle any livestock. Like the rest of our livestock supply chain, a vet inspects the animals on arrival at the processing plant. Our essential Waitrose chicken is grown on farms in Northern Ireland. What makes our ‘entry level’ chicken different to that available elsewhere is that the birds are raised in houses that provide lots of natural daylight and space when compared with a conventional poultry unit. The birds that provide the meat for essential Waitrose fresh and frozen chicken have around 20% more space than other birds (at 30kg/m2) and we also ensure they have environmental enrichment to help them display their natural behaviour to scratch, perch and play. They have straw bales for nourishment and we are in the process of replacing our A frame perches with “platform perching”. Bedding is refreshed regularly and fresh food and water are available at all times. Beak trimming is not carried out in any flocks that supply Waitrose chicken. Like all our chicken, essential Waitrose chicken is raised on farms close to the processing plant – within 45 miles in fact. Our Omega 3 chicken is raised to essential Waitrose welfare standards. Our Free Range Chicken is truly free range and given plenty of room to roam outside, while being housed in airy, well-lit sheds. These birds are housed at lower stocking densities than our essential Waitrose birds – around 10% less stock per house (27.5kg/m2). They have around one m/sq per bird of outdoor space and are a slower growing breed than our conventional chickens. Bedding is refreshed regularly and fresh food and water are available at all times. Outdoor range enrichment is provided by hedgerows and trees to further encourage natural behaviours. Our free range chickens reared for meat have access to the outdoors for a minimum of half their life, roaming the tree and shrub covered ranges. Waitrose organic chickens are raised with the lowest stocking density of all and have around four m/sq per bird of outdoor space – under our standards they have to spend half of their life outdoors. Organic finishing sheds have pop holes down the length of the sidewalls, which allow the birds free entry and exit. A concrete apron outside the shed allows droppings to be cleaned up regularly, maintaining litter quality inside the shed. The inside of the shed is bedded with clean chopped straw or wood shavings which is refreshed regularly and, of course, fresh water and feed is available at all times. Outdoor range enrichment is provided through hedgerows and trees to further encourage natural behaviours. All our chickens are transported to slaughter by Red Tractor approved hauliers and are processed in one of the most modern poultry processing plants in the country. Like the rest of our livestock supply chain, a vet inspects the birds on arrival at the processing plant. The plant is regularly audited to ensure it meets Waitrose standards; it is also Red Tractor assured. These birds are only available in selected branches and are raised to Organic Farmers & Growers Standards, which allow them access to the outdoors for two-thirds of their lives. On Monday 4th March 2019, representatives of Waitrose & Partners were delighted to sign the 2026 European Chicken Commitment, pledging to play a leading role in improving the welfare of farmed chickens. Under its commitment, signed alongside senior representatives of Compassion in World Farming, Waitrose & Partners has pledged that all fresh and frozen chicken, and all chicken meat ingredients, across all Waitrose own-brand products will meet the requirements of the pledge by 2026 (see below for pledge requirements). Waitrose & Partners already meets the vast majority requirements of the pledge, including stocking density, for all its fresh and frozen own label chicken. However, alongside our long term poultry supplier and research partner Moy Park, we are pleased to help lead research into new breed requirements that will drive forward the welfare of all farmed chickens. Comply with all EU animal welfare laws and regulations, regardless of the country of production. Implement a maximum stocking density of 30kg/m2 or less. Thinning is discouraged and if practiced must be limited to one thin per flock. Adopt breeds that demonstrate higher welfare outcomes: either the following breeds, Hubbard JA757, 787, 957, or 987, Rambler Ranger, Ranger Classic, and Ranger Gold, or others that meet the criteria of the RSPCA Broiler Breed Welfare Assessment Protocol. On air quality, the maximum requirements of Annex 2.3 of the EU broiler directive, regardless of stocking density. Adopt controlled atmospheric stunning using inert gas or multi-phase systems, or effective electrical stunning without live inversion. Demonstrate compliance with the above standards via third-party auditing and annual public reporting on progress towards this commitment. All deer are sourced from specially selected farms in the UK and New Zealand and are reared outdoors through the year. In New Zealand, this is year round, while in the UK some deer may be housed in straw bedded barns during especially bad weather in winter. Our deer are fed a natural forage based diet, the bulk of which comprises grazed grass or clover enriched swards. All deer are transported directly to the abattoir using Red Tractor assured hauliers. This ensures all vehicles and drivers meet required standards to ensure our welfare standards are met. All staff members involved in the handling of deer at the abattoir are trained in welfare friendly animal handling methods and must demonstrate a sufficient level of competence before being allowed to handle any livestock. Like the rest of our livestock supply chain, a vet inspects the animals on arrival at the processing plant. Our deer are slaughtered at a purpose built bespoke facility that allows the deer to express natural behaviour in a stress free environment. All our duck are British. A brood and move system is the basis for our farming system. Birds arrive on the farm as day-old poults direct from the hatchery. After an initial and carefully controlled brooding stage of about three weeks, the birds are moved to housing with lots of space and natural light. Stocking densities are lower than average ensuring that birds have plenty of space to express natural behaviour. They also enjoy enrichment such as straw bales. Air quality and temperature are monitored constantly to ensure that the birds are kept comfortable at all times. Every farm has a veterinary health plan and prescription only medicines are only given for specific reasons, they are never prescribed as a matter of routine. Our high welfare and husbandry standards cover the entire supply chain, from parent stock and hatchery all the way to reception and handling at the processing plant. Journey times to plant are short – less than three hours – and are undertaken in a purpose built lorry. Everyone handling the ducks is appropriately trained in bird welfare. Like the rest of our livestock supply chain, a vet inspects the birds on arrival at the processing plant. The inspection includes farm health records and an inspection of the flock. The birds are kept in small groups in a covered lairage before being processed. Waiting times are kept to a minimum to avoid stress. All Waitrose shell eggs are British and laid by free-range hens; none of our eggs are supplied through caged or barn systems. Our essential Waitrose eggs and British Blacktail eggs are laid by hens that live in true free-range systems with plenty of space to exhibit natural behaviours and lots of range enrichment to ensure their wellbeing; 20% of the ranging area the hens use is covered with trees and the grassland is actively managed to encourage the hens to roam. We have achieved our goal of 100% of our British Blacktail laying flocks being non beak trimmed; we are the only retailer in the UK who has done this. Our Duchy Original Organic Eggs are laid by organic free range British Blacktail hens raised in organic systems. What makes our organic hens different is that they enjoy organic food from birth and they are allowed outside from eight weeks of age. Waitrose only uses free-range egg as an ingredient in its products. Our entire supply chain for geese is British and free range and a brood and move system is the basis for our farming system. Birds arrive on the farm as day old poults direct from the hatchery. After an initial and carefully controlled brooding stage of about three weeks, the birds are moved to a paddock where they are free to roam and enjoy the fresh air. Stocking densities are managed to free range levels, ensuring that birds have plenty of space to express natural behaviour. They also enjoy enrichment such as grassy ranges and straw bales. Every farm has a veterinary health plan and prescription only medicines are only given for specific reasons, they are never prescribed as a matter of routine. Our high welfare and husbandry standards cover the entire supply chain, from parent stock and hatchery all the way to reception and handling at the processing plant. Journey times to plant are short – less than three hours – and are undertaken in a purpose built lorry. Everyone handling the geese is appropriately trained in bird welfare. Like the rest of our livestock supply chain, a vet inspects the birds on arrival at the processing plant. The inspection includes farm health records and an inspection of the flock. The birds are kept in small groups in a covered lairage before being processed. Waiting times are kept to a minimum to avoid stress. It is a Waitrose requirement that our UK lambs are reared as naturally as possible. Lambs stay with their mothers from birth until weaning; during this time, they suckle naturally and live in family groups. After weaning lambs stay together as a group in fields. Their diet is primarily grass and forage, however supplementary feeding of other natural options is permitted if grass is in short supply. All transportation used to carry animals must comply with all regulations in accordance with legislation, assurance schemes and our other animal welfare protocols. Lambs are yarded for two to three hours prior to loading for transport to ensure they are comfortable and relaxed in transit. The majority of our lambs only travel around 30 miles to the abattoir, hauled by the farmers who reared them. Lambs transported from further away, as with other livestock supply chains, are carried by Red Tractor approved hauliers. All abattoirs used for our lamb are regularly independently audited to Red Tractor abattoir standard to ensure the high welfare standards at all times. Like the rest of our livestock supply chain, a vet inspects the animals on arrival at the processing plant. All our lambs are electronically stunned before slaughter. Our Dorset breed lamb is produced from a group of specialist farmers in the South West of England and is the first new season lamb to arrive on our shelves each year. The Dorset ewe breeds naturally out of season; with ewes being mated over the summer with the lambs being born in September/ October and ready for the marketplace from January each year. Outside of the British season, we source lamb from selected farmers in New Zealand who also base their farm standards on the Five Freedoms and a farm assurance protocol that mirrors the Red Tractor beef and lamb scheme. Lambs have access to water, shade and shelter from harsh weather and each farm is managed by a trained stockperson. All animals are reared outside and receive most of their nutrition from pasture. All transport operators must be registered and comply with the New Zealand Livestock Transport Assurance programme. This assurance programme is independently audited by a government owned agency. These audits include random truck and driver audits at the point of delivery together with depot audits and record inspections. Drivers are trained and accredited before they can operate a livestock transport vehicle. The programme specifies stocking density, journey time process also includes a driver awareness and training accreditation. This stipulates the requirements for stocking density, journey time and regular checks of livestock by the driver. Both abattoirs used for our lamb are regularly independently audited to Red Tractor and Humane Slaughter Association abattoir standards to ensure the high welfare standardsat all times. Like the rest of our livestock supply chain, a vet inspects the animals on arrival at the processing plant. All our lambs are electronically stunned before slaughter. All of the cows providing Waitrose liquid milk and cream are British. We pledge that all cows producing milk for Waitrose will spend a minimum of 120 days each year grazing in fields. In practice, our dairy cows will graze for far longer than 120 days/year but this new pledge sets in stone a minimum standard, strengthening our commitment to animal welfare and ensuring a level of consistency across our dairy farms. Our farm grazing plans are regularly reviewed by grassland experts. We are the only supermarket to make this 120 days minimum grazing pledge across all of our dairy farms supplying us with milk. We do not permit tethering or tail docking of cows within this supply chain. For dairy ingredients, where milk is pooled and supply chains may be extremely complex, we acknowledge the challenge of engaging directly with local suppliers on these issues. We provide active support wherever possible, and where specific welfare issues are brought to our attention such as with Parmesan and Grana Padano we encourage those suppliers to engage directly with Compassion in World Farming. Our Waitrose Conventional Milk Scheme incorporates exacting standards to ensure that the dairy cows, at whatever stage of their lives, are treated humanely and with high levels of care and expertise in stock handling. The dairy cattle are required to have access to grazing for a minimum of 120 days every year. In winter, they are sheltered in clean, dry and airy barns with readily available food and water. We are continually reviewing our standards to improve animal welfare wherever we can. We have a bespoke herd health plan for use on farm that covers areas such as bedding, foot care, medicine use and a bespoke nutrition plan. 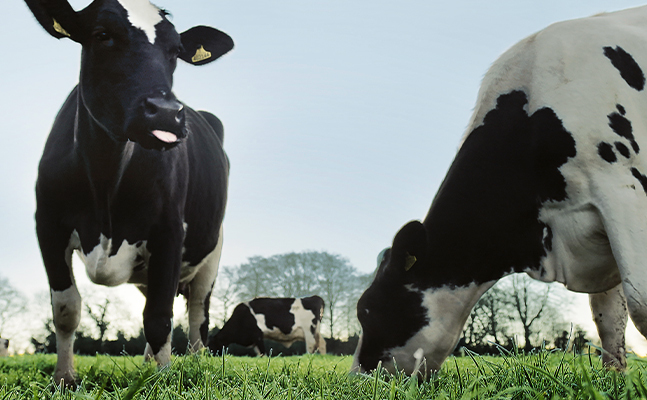 Our Duchy Originals from Waitrose Organic Milk comes from cows raised in organic systems. They graze outdoors when field conditions allow while in the winter they are sheltered in bright, airy barns. All our organic farms are asked to demonstrate measurable levels of improving health and welfare managed through natural diets and low stocking rates. Like all our milk herds, the animals are fed natural diets that vary according to their physiological needs and their stage of lactation. Farmers focus on breed specific husbandry techniques to ensure stress free cows. Our farms’ accreditation to organic and Red Tractor standards with the addition of our bespoke standards gives independent accreditation for animal welfare. All surplus dairy bulls born into our dairy supply pool are integrated into either our high welfare beef or veal supply chains ensuring they remain in the UK. All our goat herds are British. Like all Waitrose farmers, great animal welfare is a key priority for our goat farmers. They operate beyond the requirement of the Red Tractor Assurance Scheme and their goats are housed in large airy barns and bedded on fresh straw every day. They are housed in social groups according to their stage of production ensuring a known, secure hierarchy allowing plenty of social interaction. Young kids are raised in specialist nursery units with group housing to ensure social enrichment. All the billy goats (male) born into our milk herds are reared to provide meat rather than being destroyed at birth. All of the fresh pork we sell is British – along with Waitrose sausages, bacon, British ham and gammon – comes from pigs that are either outdoor bred or free range. Pigs that supply our essential Waitrose pork are born outdoors – we never use farrowing crates or sow stalls. Weaned pigs – approximately four weeks old – are finished indoors in straw bedded, light and airy buildings. No farms use slatted floors and all growing accommodation is straw based. All our supplying farms have a lower stocking density than the pig industry standard. All our sows spend their entire lives outdoors. All the pig farms we use must have an emergency plan to deal with any water supply issues and care of animals during extreme weather. As in the rest of our supply chains, we are committed to eradicating the need for any veterinary mutilation of our livestock; in this regard, we are working on research to reduce further the need for tail docking. In our supply chain pigs’ tails are docked only when recommended by a specialist veterinary surgeon to prevent tail biting, with only the tip removed. Similarly, the clipping of teeth is only carried out in exceptional circumstances under specialist veterinary advice by trained stockpersons to protect sows’ udders when necessary. Castration is not permitted and farrowing crates are also prohibited. As with our essential Waitrose pork, all the sows are kept outdoors their entire lives and live in straw filled arcs and tents on free draining sandy soils. At farrowing, the sows are given their own specific hut for raising the litter until weaning at four weeks old. Having been born outdoors, the growing pigs are raised outdoors in paddocks and allowed to range freely. Within each paddock there is a straw bedded arc for shelter. All farms have a lower stocking density in line with our higher welfare requirements. At a minimum, the stocking density for our free range pigs is 36m2/pig. Tail docking is not allowed under the free-range system as tail biting is not an issue. We apply the same high welfare standards as free-range pigs above, but pigs are raised to Soil Association organic standards. All our pigs are transported directly to the abattoir by hauliers approved by Red Tractor. All drivers must undergo specialist welfare training to ensure the highest standards are met. No journey lasts longer than five hours with the average journey time being three hours. No electric goads are used in the moving and loading of pigs. All lorries have lift up decks and straw bedding is used. In summer, extra water is provided and where possible, pigs are moved in social groups. Like the rest of our livestock supply chain, a vet inspects the animals on arrival at the processing plant. All slaughter is undertaken fully certified and maintained to the standards laid down by British Quality Assured Pork. Dalehead Foods, our processor, recognises and operated within the guidance set out by the Humane Slaughter Association and Freedom Food for animals at the point of slaughter. Our essential Waitrose farmed salmon supply partnerships are small to medium sized farming sites in Scotland, each with an experienced team of husbandry experts. Our organic salmon is supplied by Scottish and Irish farms. All farmed fish must be fully traceable to known and audited Waitrose approved farm sites. Audit protocols must include assessment of fish welfare, veterinary care, husbandry, protection of the marine environment and sources of marine based feed ingredients. We do not allow mutilating procedures such as fin clipping on our farmed fish. Farmed fish must be independently certified to a recognised third party standard or be working towards achieving certification before 2020 – we have already achieved nearly 90% certification. The following third party certification schemes are recognised for farmed fish: Aquaculture Stewardship Council (ASC), Global Gap, Global Aquaculture Alliance Best Aquaculture Practice (GAABAP), Friend of the sea (FOS), Soil Association Organic and Naturland Organic. The scope of the certification must include processing facilities, farms and hatcheries. Aquaculture activities must be conducted in a manner that is socially responsible and within national rules and regulations, with regard to ILO convention on labour rights, not jeopardising the livelihood of aquaculture workers and local communities as laid out by the John Lewis Responsible Code of Practice. Salmonids (Salmon and Trout) – Global Gap and/or Organic (Soil Association, Naturland). Marine Fish (Bass, Sea Bream) – Global Gap or Best Aquaculture Practices or Organic. Freshwater Fish (Tilapia) – Global Gap or Best Aquaculture Practices or Organic. Shellfish (Mussels, Oysters) – Global Gap or Best Aquaculture Practices or Organic. Warm water Prawns – Global Gap or Best Aquaculture Practices or Organic. Marine based feed raw materials must only be sourced from responsibly managed fisheries. Waitrose supports the International Fishmeal and Fish Oil Association’s Global Standard and Certification Programme for the Responsible Supply of Fishmeal and Fish Oil (IFFO RS). Marine based ingredients used in the production of Waitrose salmon, trout and halibut are from IFFO RS certified stocks and all farmed fish diets are produced using IFFO RS, MSC or FOS certified marine ingredients. The marine feed ingredients used in the fish feed for Waitrose Organic salmon, Rainbow trout, Brown trout and Halibut are produced from trimmings from fish responsibly caught for human consumption. All diets are certified as organic and all ingredients are fully traceable. The use of non-marine ingredients in feed diets is permitted under the Waitrose Fish Feed policies. However, the inclusion of vegetable protein ingredients must be of non-GMO origin and inclusion rates must not compromise fish welfare or the eating quality and nutritional value of the final product. (It is Waitrose policy to ensure that salmon and trout are fed on a diet that ensures the following levels of EPA/DHA in the finished product to deliver the health and nutritional benefits that our customers expect. Conventional Salmon 1.61g/100g. Organic Salmon 1.5g/100g. Rainbow Trout 1.5g/100g. The use of processed animal protein (PAP) and animal derived lipids and blood meal are not permitted. The Waitrose ‘Responsible Harvest Assessment’ (RHA) assesses key control measures used to ensure harvesting of Waitrose salmon and trout is carried out in such a way as to minimise stress and with concern for animal welfare as a primary principle. Its core values are to promote continuous improvement, to create aspiration by rewarding innovation and good practice and to ensure compliance to the Waitrose Aquaculture Farming Protocol. The assessment itself, currently its first year of implementation, covers a range of criteria, including: detailed on-site system checks, specific KPIs, fish welfare, workers’ welfare, hygiene and brand protection. All Waitrose Turkeys are farmed in England, Northern Ireland and the Republic of Ireland and are kept to our award winning standards of animal welfare. Unlike others, even our entry level essential Waitrose turkeys are farmed to higher welfare standards, with natural daylight, fresh air, room to move around and always fed a diet free from GM soya protein as a minimum standard. Waitrose free-range turkeys are raised on selected small farms in the UK and Ireland. They are provided with both indoor shelter and outdoor range areas during their growing period. Access to grass paddock is unrestricted during daytime hours for at least half the birds’ life and housing is available for them to return to shelter. Range areas are predominantly grass and areas of interest such as straw bales, trees, scrub and mixed vegetation are provided for range enrichment. Duchy Originals from Waitrose Organic turkeys are raised in England and Ireland. A slow growing, bronze feathered breed, they are broadly similar to free range but with additional requirements to meet the Organic regulations and the Waitrose bespoke requirements. Stocking densities are very low, like our free-range birds, with plenty of environmental enrichment available. Waitrose organic turkeys are not beak trimmed. All our turkeys are transported to slaughter under National Welfare of Animals (Transport) regulations, which cover welfare and safety standards. All drivers involved in moving turkeys have received formal independent training in bird welfare. Farms are located within four hours’ drive of the plant and transport vehicles are specifically designed for the movement of turkeys. Like the rest of our livestock supply chain, a vet inspects the birds on arrival at the processing plant. Waitrose pioneered the sale of UK-produced High Welfare Veal. We have one dedicated veal supplier that we have worked with for more than 30 years. The veal calves are reared in big social groups in large, airy barns bedded with deep straw with lots of room to move around, including some access to outside yards. They have access to ad-lib milk and are offered some home-grown cereals to supplement and enhance their diet. We have an integrated supply chain and our veal calves originate from the Waitrose dairy supply chain; this ensures that our male calves are not slaughtered at birth or exported. The export of veal calves is prohibited. Veal calves are transported to the abattoir by one dedicated, Red Tractor approved haulier and all drivers are properly trained in animal welfare. The haulier ensures that welfare is maximised for the calves by ensuring lots of straw and sawdust are used in the vehicle to maximise their comfort. The welfare of the veal calves at the abattoir is of the utmost importance to Waitrose. Our abattoir has been purpose built with the help of animal welfare experts and to the ideas of Temple Grandin; the facility operates a detailed animal welfare policy. As with our other livestock supply chains, all staff must demonstrate high levels of competence before being allowed to handle cattle. Like the rest of our livestock supply chain, a vet inspects the animals on arrival at the processing plant. Waitrose is a part of a global coalition of companies behind 'The Protein Challenge 2040'. Convened by the NGO Forum for the Future, this initiative explores how we feed nine billion people enough protein in a way which is affordable, healthy and good for the environment. The first strand of this initiative explores the question of how to increase the proportion of plant-based protein consumption among consumers. In line with this, Waitrose has recently expanded its total vegan and vegetarian assortment by 60%. The second strand of this initiative, Feed Compass, focuses on how best to assess and improve the sustainability of animal feed, based on a range of criteria including animal nutrition and welfare. You can read more about our work on sustainable animal feed here. Waitrose livestock schemes have evolved over the last 20 years and are underpinned by an ethos of continuous improvement. 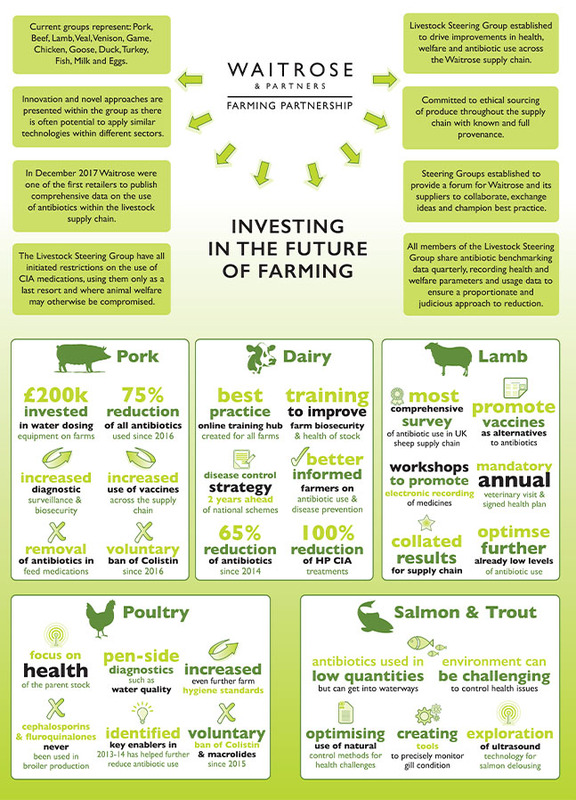 This includes the regular review of both technical and financial performance; trends in welfare outcomes and investment in a wide ranging Research and Development portfolio which has improvements in animal welfare at its heart. These research projects are done with a wide number of reputable educational establishments providing the opportunity for emerging scientists to work closely with our livestock supply chains. In conjunction with our suppliers we monitor a wide range of key welfare performance indicators to ensure continuous welfare improvement for the animals in our own-brand supply chains. Details on the full range of our KPIs, which apply to our own-brand products, are available in the attached charts. Measured from start of loading until last animal has entered lairage. During the course of the year, unfortunately, there were two lorry accidents involving the pig supply chain. This is a very rare event considering over 4000 loads of pigs have been transported by our supplier during 2017, and no accidents occurred in 2016. In one case, 23 pigs were injured and after a veterinary inspection had to be destroyed. 4. Percentage of livestock reared to Red Tractor (plus) Assurance Standards or equivalent. In all cases there are additional higher welfare bolt-on requirements that are independently verified at the time of the Red Tractor inspection. Details of species-specific policies and standards are provided above. Details of our higher welfare continental standards can be found in the relevant sections above. In line with our supplier Winterbotham Darby's commitment to move all their continental farms through their tiered bronze, silver and gold EFP farming standard (see section on 'Continental meat'), and in support of Waitrose's Cage Free award from CiWF, all our continental pigs will be free from confinement by 2025.